I tried to read both the Fagles and the Lattimore translations, but it was just too much work to do both. 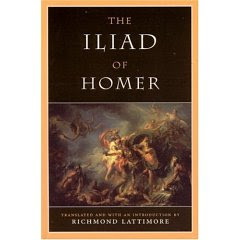 I found the Fagles easier to understand in the beginning, but I found the Lattimore flowed more like poetry. Fagles helps one to know who is being talked about and the wheres of things, but once I knew who all the characters were, I didn't need his simplified explanations anymore. Lattimore really is the "definitive" source by all the experts, and I can see why that is so. 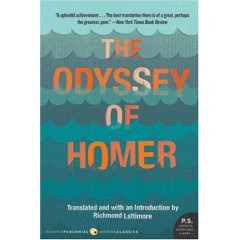 With the help of Michael's teacher reading it on MP3 with explanations as she read, I let the Lattimore translation carry me away. I also want to read the Shakespeare plays I will be seeing with Laura and friends when we go down to Ashland to the Oregon Shakespeare Festival for her 40th Birthday weekend July 18-20! YES! I feel so proud. I really liked it. It helped to have it on my iPod and listen while I lifted weights and ran on the treadmill. I think it is in its final form a romance. I am watching The Teaching Company tapes by Elizabeth Vandiver, and it has really added to my understanding. I wonder what is next on my list? I have to find my list. LOL!